Royal NoneSuch Gallery, a small artist-run alternative art and event space in Oakland's Temescal district, began as an alternative to conventional models right from the start. Founders Elizabeth Bernstein and Carrie Hott, acquaintance-slash-friends on Facebook, deepened their connection when Bernstein posted that she was looking for someone to partner with her to start an artist-run space. She already had the space and she wanted someone to share it with. This month, after two years of successfully managing operations between the two of them, Bernstein and Hott conducted a similar search before partnering with Carey Lin and Kathleen Quillian. This expansion allows each to maintain an interest in the gallery while further distributing labor and allowing more time for individual pursuits. Overall it is a lean operation, with fundraising limited to the overhead costs of keeping the lights on and the doors open and viewing hours limited to the weekend. Among the organizers it is a labor of love: each volunteers their time. This open-handed, collaborative approach to authorship is, in itself, a salient alternative to most alternative spaces based on jealously guarded singular leadership. Space, Time and Architecture, a two-person exhibition featuring works by Cybele Lyle and Luca Nino Antonucci, is the first show curated by this newly expanded foursome of organizers. Programming is selected through a democratic process within the group. This pairing of artists, as the first show of the year, auspiciously received a unanimous response among the four, cementing their faith in Royal NoneSuch's unique organizational style. Interestingly, Space, Time and Architecture reflects the gallery ethos while presenting the distinctly separate practices of two artists previously unfamiliar with one another. Rather than delineating space within the gallery for each artist, the work is intermixed. It is a dynamic pairing that reveals itself quietly. Lyle's prints alternate with Antonucci's print transparencies, cleanly installed around the one room space. The later features text, redacted by Antonucci, from architectural historian Siegfried Giedion's seminal book Space, Time and Architecture: The Growth of a New Tradition, published by Harvard University Press in 1941. (Giedion is counted among those who influenced the work of media theorist Marshall McLuhan, who in turn would probably have found some amusing significance in Giedion's work ending up as edited text in a gallery formed over the bonds of Facebook. The medium is the message, indeed.) 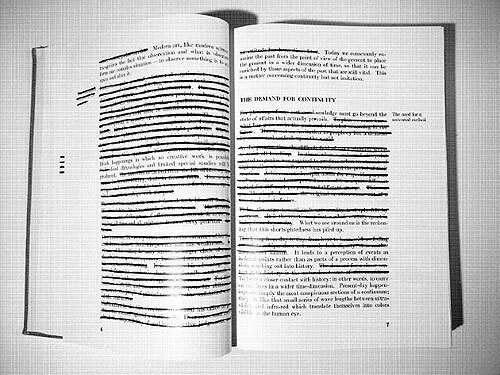 Using an actual tome, the artist has begun editing the book to create a distillation of the author's essential arguments -- at the same time, Antonucci's redactions update the tenets of the book to reflect the collaborative phenomena evident in today's creative practices, from social networking to collective production. Antonucci's copy of Space, Time and Architecture, each page variously altered with white paint or black lines, sits on a quirky pedestal in the center of the space. The visual quality of the pedestal mirror's Lyle's prints, purely by coincidence, as seems to happen quite naturally here. 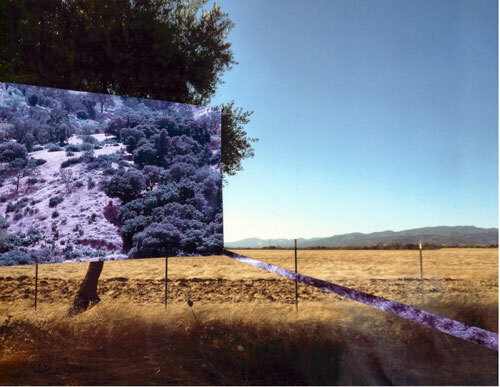 Lyle's prints are a departure from a larger body of work that explores projected images in architectural space. Each print is an image collaged from Lyle's photographs of the natural landscape, cropped and arranged as architectural elements in open space. The original compositions are scanned and printed on metallic paper. The result is a series of uncanny landscapes where familiar elements are made surreal and a fourth dimension, merging time and space, is made real. "Space, Time and Architecture is an entity in itself which, with all its shortcomings should not be disturbed," reads some of Giedion's text revised by Antonucci. The work is both collaborative and revisionist; a reflection on the imperative to study and respect old models -- before destroying them to create anew from the pieces. The gallery mission statement treads familiar territory -- denying commercial interests, emphasizing community and experimentation -- while reflecting an ideology that is both the driving compact of its partnerships and its programmatic agenda. It's the approach not the agenda, per se, that is new here. Royal NoneSuch Gallery reflects a true alternative based on collaboration, with a willingness to reinvent as space and time allow. Long may it reign. Space, Time and Architecture is on view at Royal NoneSuch Gallery through February 26; Saturdays and Sundays 1 - 4 and by appointment. For more information visit royalnonesuchgallery.com.